“It would be nicer if the weather were warmer”, says Fiona. Still, Kriek De Ranke is lovely. The aroma smothers you in amarena ice cream, but the taste is a whack of mouth-watering tartness that somehow evolves into velvet and something else besides. “It has a musty taste like the smell of a wine cellar”, Fiona adds, “but in a nice way”. Gorgeous. This is a serious kriek, not the sweet sodapops you sometimes see, and it hits all the right notes. I would highly recommend it. I think I’ll have to try a comparison tasting of Kriek De Ranke against Cantillon Kriek or even Boon Kriek Mariage Parfait 2008. Kriek De Ranke seems a bit smoother than the former yet somewhat sharper than the latter, but it calls for a side-by-side test. 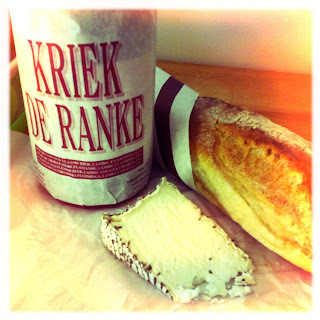 Like its sister, the gueuze Cuvée De Ranke, Kriek De Ranke also goes very well with cheese. It would almost certainly go well with a sunny day, too, but it looks like it’ll be some time before I’ll be able to confirm that. Well, this morning it was 6C, but right now, it's beautiful out: warm and sunny. Unfortunately, I don't have a second bottle!